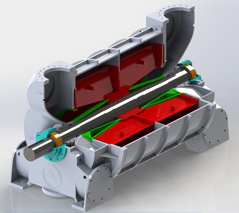 We have designed many vacuum systems for our customers and have worked with the best engineering firms to incorporate our pumps and systems into their larger designs. All of our work is done in Solidworks and any format of drawing is available to our customers to integrate directly into their models. We have full Finite Element Analysis capability, and also do fluid flow analysis. Our engineers have combined experience of over 200 years, and we enjoy solving problems. The liquid ring pump is a positive displacement pump with one moving part, two bearings and no wearing surfaces. The pump is symmetrical with the plane of symmetry perpendicular to the shaft at the center of the pump. The chambered rotor (the only moving part) sits eccentrically in the pump body. The eccentricity is such that the rotor almost touches the body in its closest approach and moves away from the body to almost the depth of the chamber in its farthest retreat. The shaft going through the center of the rotor is horizontal. In operation, a sealing fluid (typically water) is placed inside of the pump and the rotor is turned at such a speed to cause the liquid to be thrown against the body interior and form a ring of fluid. 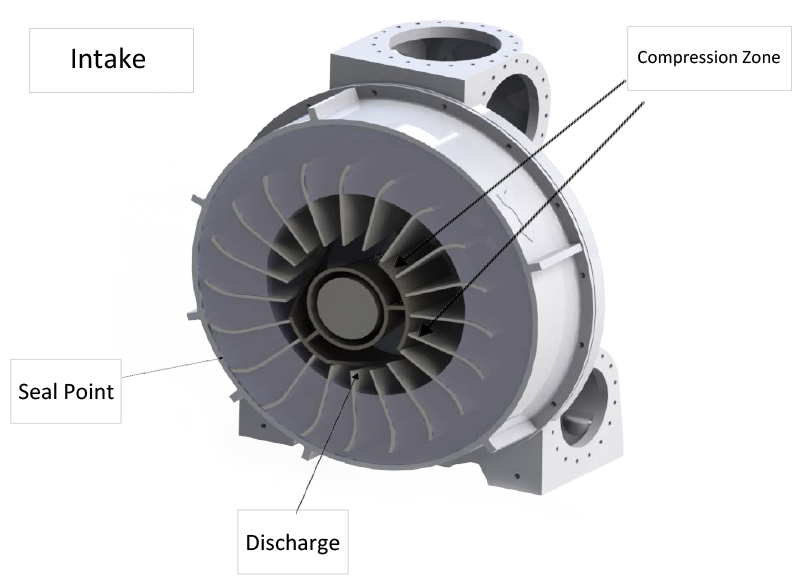 Because the rotor is eccentric in the body, the chamber of the rotor is full of water at the closest point (seal point) and empty of water at the point where the rotor is furthest from the body. The water thus becomes the piston of a compressor. If you restrict the chamber of the gas being drawn into the pump, the pump will continue to pull the gas out of the chamber causing it to be below atmospheric pressure, or at a vacuum. If you restrict the chamber to which the gas is pumped , you will compress the gas to above atmospheric. The chambers in our rotors are open on both outside diameter and the inside diameter. As discussed above the outside is sealed by the sealing fluid. The inside is sealed by a cone with two windows, an inlet and a discharge. Between the inlet and discharge windows is a compression zone and between the discharge and inlet windows is a sealing zone. The heart of the operation of the pump is in the very tight clearances between the rotor and the cone necessary to make the pump seal, both so the gas can be compressed and the leakage between the high pressure discharge and the low pressure intake is minimized. Our pumps can be used to pump a variety of gases and in a variety of conditions. Properly sizing the pump and picking the materials of construction and sealing systems is what we do. Please contact us with your needs.